I read this article and found it very interesting, thought it might be something for you. 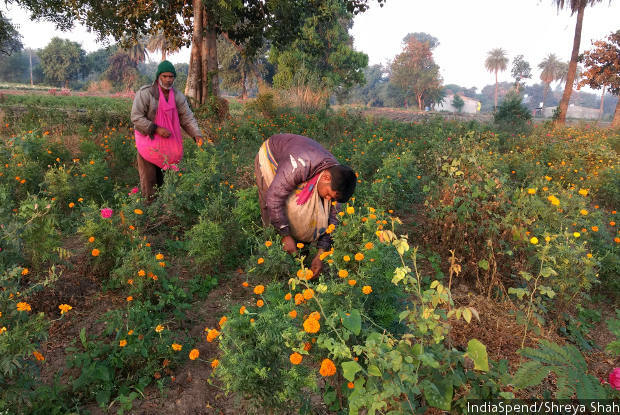 The article is called Why A Flower Farmer Cannot Join The Cashless Economy, A Year After Demonetisation and is located at https://archive.indiaspend.com/cover-story/why-a-flower-farmer-cannot-join-the-cashless-economy-a-year-after-demonetisation-97290. Keshu Patel and his son Kantilal pluck marigold flowers in his field in Mirjapur, Madhya Pradesh. Post notebandi, the unpredictability of getting cash, which he needs for all his transactions–groceries, payment to labourers, transporters–has left him anxious. Patel’s predicament underscores the difficulty small farmers face in moving to digital payments, which have increased overall over the past year. Though, farmers and traders said the move to demonetise notes did not have a lasting effect on prices in the flower market, the shift to payments by cheque for large transactions had delayed when farmers would get cash in hand, impacting household purchase decisions, particularly as small farmers and traders struggle with the banking system, and low financial and digital literacy. Many farmers do not own a smartphone–1 billion people across India do not–so they cannot access mobile banking services or internet-based payment systems. Last year, IndiaSpend had spent a day with Patel to understand the impact of demonetisation or, notebandi as it is locally known. Because of lack of cash in the market, flower prices stayed low even in the wedding season, leading to a loss of 70% of Patel’s usual income between the months of October and January. 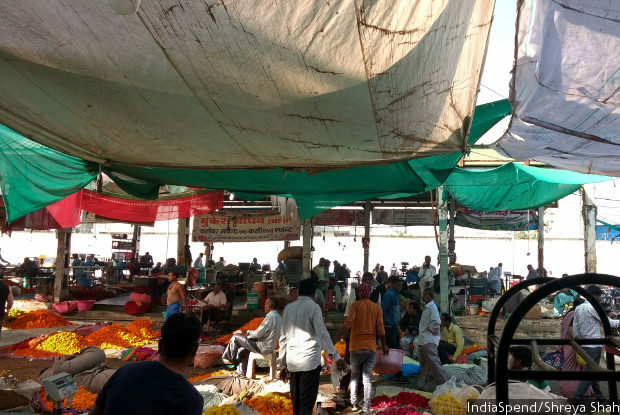 One year after the decision to invalidate overnight Rs 14 lakh crore–or 86% by value of Indian currency in circulation–IndiaSpend visited Patel and the Indore flower market to know whether there were any lasting effects of the move. Patel is one of 118.6 million Indian farmers, as the Census recorded in 2011–equivalent to the population of the Philippines. As many as 9.8 million farmers live and work in Madhya Pradesh, one of India’s poorest states. Patel is a “small farmer”, as he has about 2.5 acres of land, less than the average land held by an Indian farmer (2.84 acres), according to the agricultural census of 2010-11, as IndiaSpend reported in December 2016. This year, Patel first sold onions, which he said sold at a rate lower than what he had expected. But the main problem he faced, he said, was that traders would insist they pay him via cheque, some of them post dated. “It would take 4-5 days for the money to come into the bank account, and then we would have to go and withdraw from the bank,” he said. For everyday transactions which would barely amount to Rs 500-1,000, including paying for the transport of produce, engaging with the banking system was more trouble than it was worth. “First you go to the bank to deposit the cheque,” said Patel. “When you go back to withdraw money, they will sometimes tell you the signature doesn’t match, sometimes you will be asked to get the Aadhaar card.” He said his older brother who lives in the same village sold about 25 quintal of soyabean at Rs 2,300-2,400 per quintal about five days ago, but the money hasn’t reflected in his account yet. The Madhya Pradesh government had said farmers could be paid upto Rs 50,000 in cash, but reports said farmers were still being paid by cheque. “We need money immediately if some disease attacks our crops. If we don’t spray the davai (insecticide or fungicide) immediately, it causes us a loss,” said Patel. 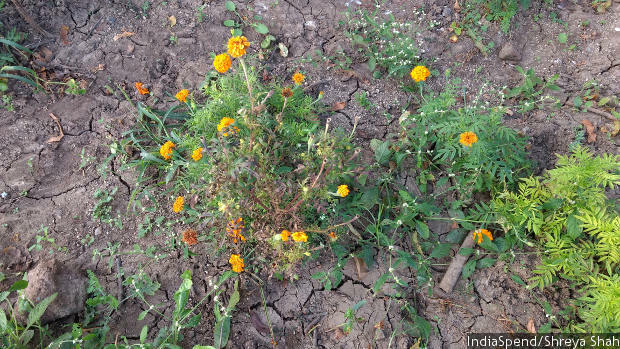 This year, a part of Patel’s marigold crop withered due to a disease he calls “kapadia”, similar to blight, which blackens leaves and withers flowers. A diseased marigold plant in Keshu Singh Patel’s farm. This year, a part of his crop was spoilt because of disease. When asked whether he uses a card to make payments at the local grocery store, Patel is at a loss. He said grocery shops don’t have a card, that his bank doesn’t give him a card–only cash–and then that he only has a bank account. His son, Kantilal, explains that he owns a card he uses only to withdraw money from the ATM, but right now they have no money in the bank. It is a period of low prices at the mandi (market), not because of any lasting effects of notebandi, but because of the usual ups and downs in the market, said Shabbir Abbasi, 52, a worker at Bharat flowers at the Indore mandi. “Prices should go up in some days as the wedding season begins,” he said. Patel hasn’t started regularly selling his produce of marigold and chrysanthemums at the market–he said he will start in a couple of days as his produce matures and prices go up. “There is no money in the market. I don’t know why,” said Champalal Kehlewad, 47, a farmer who sells his produce–flowers, soyabean, potatoes, other vegetables–at the Indore market. “It’s like even nature isn’t supporting the current government,” he said, giving the example of poor monsoons this year. The flower market in Indore, Madhya Pradesh. Last year, the month after notebandi, flower prices had stayed low even in the wedding season. But there hasn’t been a lasting impact of notebandi on prices, traders and farmers said. “I still don’t have a bank account,” said Jagganath Mahadeo Bhuyyer, who goes by the name Bhausahab, and owns a flower shop in the mandi. He had told IndiaSpend last year that it was too much trouble to start and operate a bank account. “But I am going to open an account tomorrow, on Wednesday, which is an auspicious day,” he said. He said he was selling his house, and he would put money from the sale into the account. Overall, India has high bank account ownership with 63% Indians owning a financial account of some kind. But only 12% used an advanced bank account service such as bill payments, insurance and loan payments in 2016, as IndiaSpend reported in October 2017. Mukesh Mukati, a farmer who sells at the market, has a bank account, but he doesn’t use it regularly. “There has to be enough money in the bank to use it,” he said, explaining that he has also taken a loan from the bank. He said he runs the household on the the cash he receives at the flower market everyday. It is the big traders in the flower market who receive payments by cheque. Pankaj Parod, 37, a trader, has been working in the market for 15-20 years. Before notebandi, there were some payments by cheque or direct bank transfers, but most of the transactions were still in cash, he said. “Now people who buy in bulk, pay by cheque or transfer the money to the bank, but farmers still want us to pay them cash because the amounts are too small, and this delays payments,” he explained. No one in the mandi has a credit or debit card machine for payments. “Earlier we used to buy groceries–oil, sugar–in bulk but now we only buy a 1 kg of oil or ½ kg of sugar at one go,” Patel, the farmer, told IndiaSpend. “We are uncertain when the next cash payment will reach us. I’ve never been so anxious about all this in my life. But now I am,” he said. I can accompany Shreya next time she goes for survey where people are facing difficulty in transaction and help them out, we pay 100% wages through Bank to our workers earning as low as Rs 6000/ per month, everybody has a debit card. I can accompany Shreya next time she happens to be there for survey where people are facing difficulty in transaction and help them out, we pay 100% wages through Bank to our workers earning as low as Rs 6000/ per month, everybody has a debit card.